As part of Lake Region Middle School’s Me to We project, 7th–8th graders attended a three-day, two-night residential experiential learning adventure on the coast of Maine where they built solar vehicles, studied world ecosystems, participated in a mock trial to debate global environmental issues, and tracked the transport of food and goods from one international port to another. Back at school in Naples, Maine, during an interdisciplinary unit on immigration, students were each given new identities and cultural backgrounds, and moved through the steps of becoming U.S. citizens at a culminating Ellis Island experience activity. Lake Region Middle School’s Me to We project was funded by a 2012-2013 Sharing the Dream Grant. This guest post is by Nick Rousos, principal of Laurel Ridge Elementary School in Fairfax, Virginia. As a Laurel Ridge ES staff we had discussed changing the grounds of our school from spotty grass and mud into a multi-ecosystem “outdoor learning lab.” We envisioned addressing storm runoff and erosion issues on school grounds, having students study on-site water flow as part of an understanding of watersheds, and tying learning into the ways these issues impact global ecosystems. 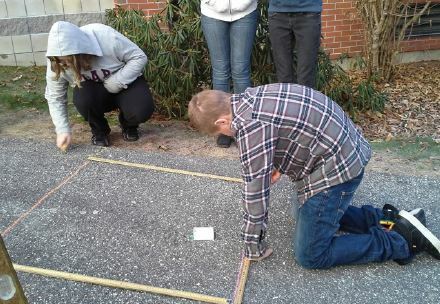 Teaching students using an experiential model increased their curiosity and engagement in what they were learning, which led to more excitement about school and learning. The students have taken more ownership and pride in their school and the environment, making them better citizens of the world. With the addition of some key parents and the Sharing the Dream grant, this project evolved from design concept and hope, to reality. Lands and Waters came out to work with first graders to raise worms in order to harvest the “tea” and compost to enrich garden soil. 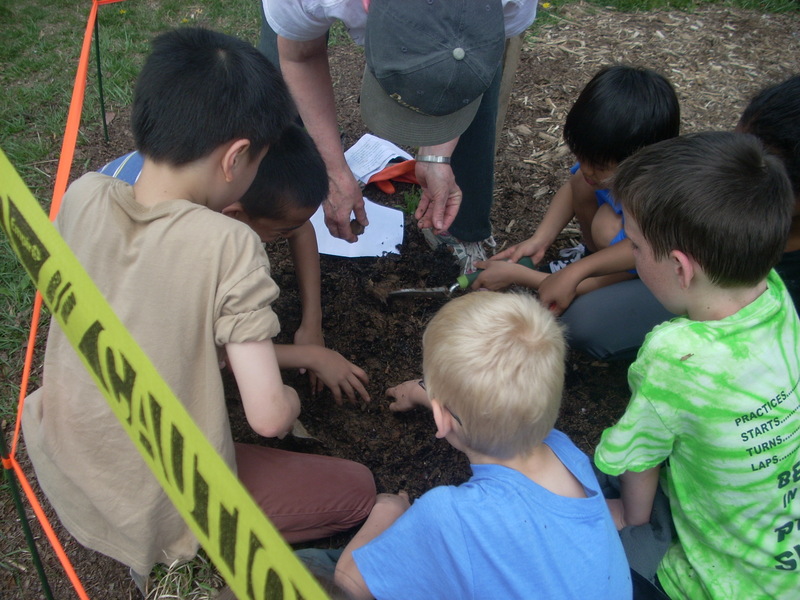 They assisted fourth grade as students tied the study of the colonists and Native Americans to the “real cost of food” program, planting vegetable gardens in raised beds. Kindergarten is enhancing their study of seeds by planting pumpkins and cultivating the plants. Second grade planted milkweed for the new Monarch Butterfly way station and will release their butterflies into that garden after raising them from caterpillars. Laurel Ridge students prepare milkweed seeds for cold stratification. 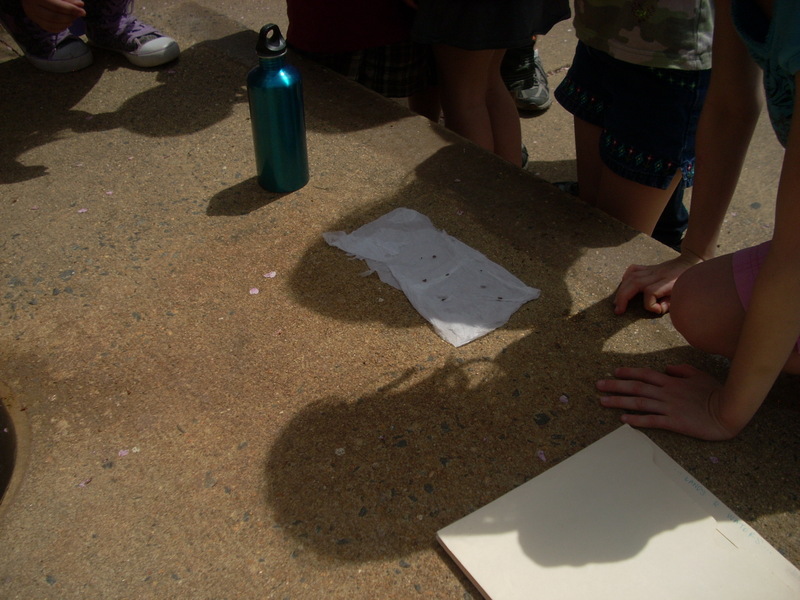 Student leadership grew as a Penny Race was conducted by our SCA to raise funds for the plants in the gardens. 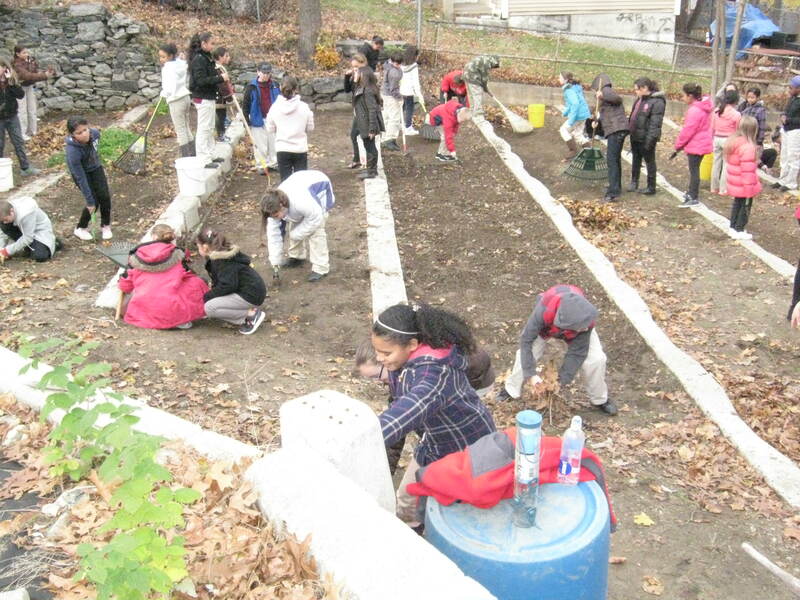 Open work days continue to be scheduled during which a large cross section of parents, community members and students work together to create and maintain the garden spaces. We cannot thank NAESP and MetLife Foundation enough for encouraging our students and assisting our efforts to beautify our environment by helping us to create spaces for our native plant species to flourish and be studied. It is my sincere belief that through their direct involvement the children have both a deeper understanding as well as appreciation for their native surroundings and stewardship of the global environment. 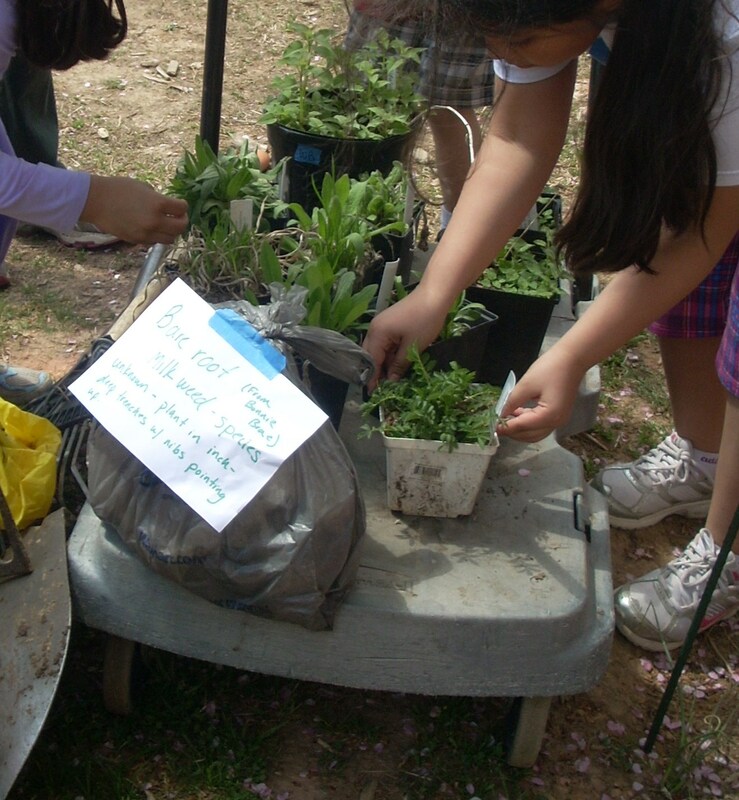 Read more about Laurel Ridge Elementary’s international garden and outdoor learning lab in “Spring Planting at Laurel Ridge Elementary,” posted 4/29/2013. 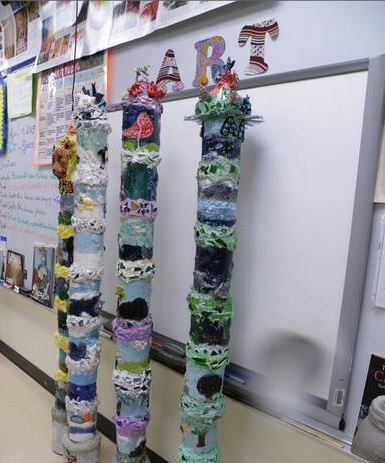 Fifth graders at Muller Elementary, a performing arts magnet school in Tampa, FL, showcased what they learned about regions and cultures of the world by creating full-scale totem poles for the school’s Global Garden, a Sharing the Dream-funded project. The sculptures, constructed from 2-liter plastic bottles, glass, empty paint cans and other found materials, are decorated with plants, animals and natural scenes inspired by the seven continents. “They are all very different and unique,” said Muller Elementary’s principal, Wendy Harrison. 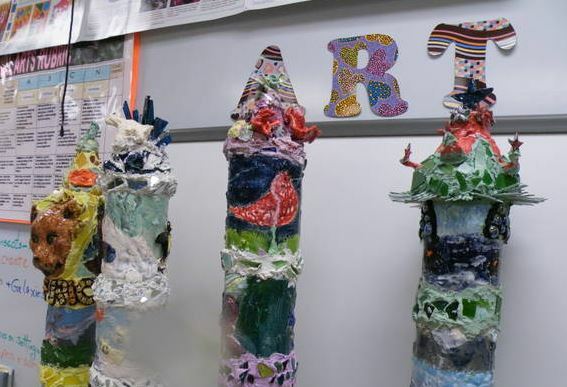 The eye-catching sculptures were recently exhibited in a district-wide recycled art show, before being installed in the garden, which is divided into seven areas, each representing a continent. African daisies and Birds of Paradise have been planted in the African section, and planting is underway in the European section. A “living fence” of Sweet Viburnum hedges has been planted around the site of a future outdoor stage for students, families and community members to gather around to watch music and drama performances. 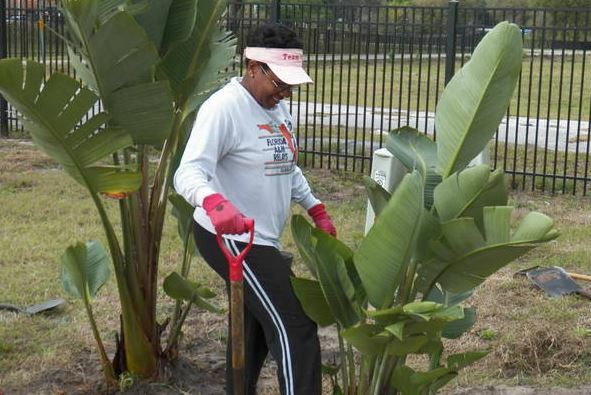 The school has held four family gardening events since the beginning of the school year, with up to 60 people pitching-in to plant, mulch, weed and water. At one event, lead teacher, Kathy Dimitriezki, noticed one dad hanging back as his kindergartener worked. Now she and Dimitriezki look at every patch of green space as a potential spot for vegetables and flowers. After a late, unexpected frost, spring has finally arrived in Fairfax, Va.
At Laurel Ridge Elementary, 2nd graders prepared milkweed seeds for the school’s new pollinator garden, and made nesting straws for native bees. The school won a 2012-2013 Sharing the Dream grant to fund an international garden and outdoor learning lab. Under the guidance of Jeanette Stewart and Christine Kauffman from Lands and Waters, a nonprofit dedicated to environmental conservation and education, and Cindy Wacker Barth, of the Monarch Teacher Network, students planted native grasses and nectar-producing plants in a pollinator garden to attract bees and butterflies. 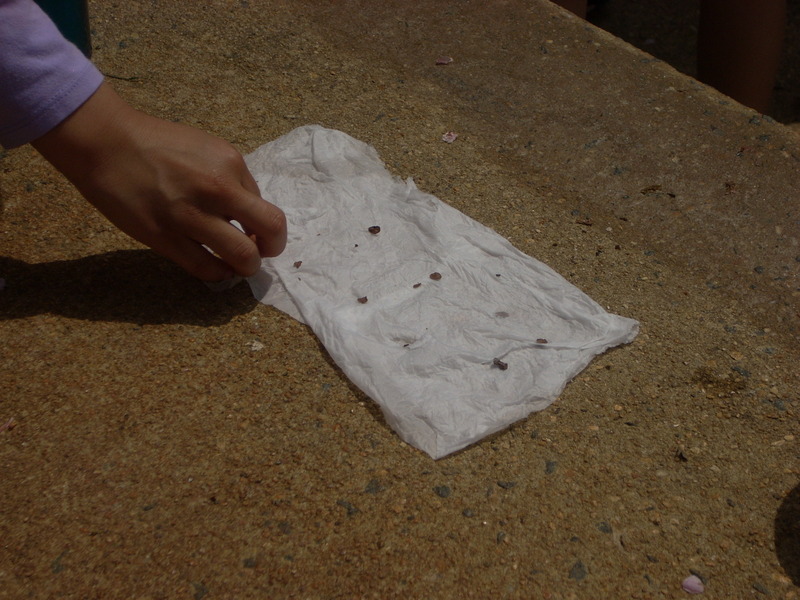 The children separated milkweed seeds from the fluff that makes them float through the air, and put them on a damp paper towel that will be rolled up and stored in a freezer for three weeks–a process called cold stratification. Milkweed seeds require a cold period to germinate, and freezing them tricks the seeds into thinking they are experiencing winter. Planting milkweed is essential to attracting Monarch butterflies. Their caterpillars feed only on milkweed. 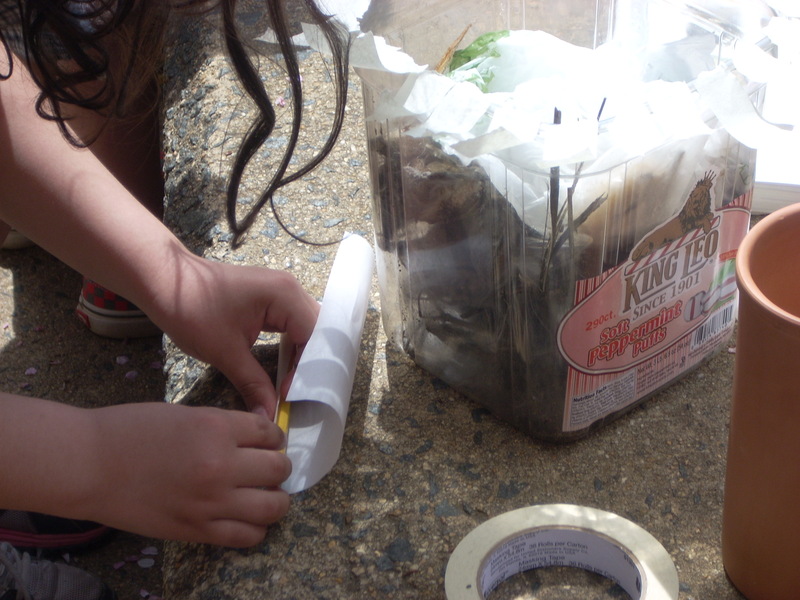 The children also constructed nesting straws for bees out of parchment paper, which will be bundled together with twigs and other natural materials and attached to a tree near the pollinator garden. Bees native to this region don’t live in hives. They live in burrows under the ground, and will lay their eggs in the nesting straws. 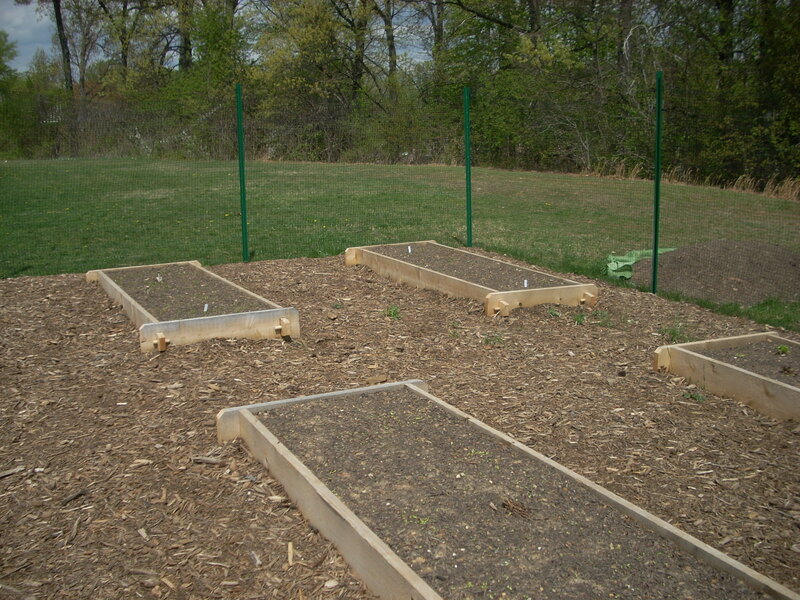 Near the school’s playground, raised beds for an international garden have been built and planted with a variety of vegetables that will soon start to emerge out of the ground. After the planting session was over, the children were proud of what they accomplished. “I’m going to ask my mom to come and water our garden!” one student said. When teachers at Harris Elementary in Woonsocket, Rhode Island, surveyed students about their knowledge of plants and farming, only three percent said they had ever seen a vegetable garden. Fifth grade teacher Eileen LaRiviere was not surprised. The majority of Harris Elementary students live in the city, with limited access to green space. “They’d seen pictures, but had never seen a working garden in person,” she said. Harris Elementary is using a Sharing the Dream grant to take students to local farms, and to plant a community garden on school grounds where they can grow and harvest their own fresh produce. This past fall, children researched the types of vegetables that could be grown in their New England climate and what plants would attract butterflies and ladybugs. They grew seedlings indoors, cleared garden space outside, and planted winter rye, a crop that grows in colder seasons and can be plowed back into the ground in the spring to provide nutrients to the soil. Students also were exposed to vegetables and herbs used in international cuisines and encouraged to try foods unfamiliar to them. “The kids have cooked soups, stir-fries, and Spanish dishes,” said Esther Zuraw-Burns, a 4th grade teacher. For the 97 percent of students who have never seen a working garden, a field trip to Pezza Farm, which supplies Harris Elementary’s cafeteria with fresh, organic vegetables, is scheduled for this spring. “Students will understand where their food comes from,” said LaRiviere. Trips to Roger Williams Park Botanical Center, an herb farm, and an apiary—where beehives are kept—are planned for the coming weeks. To get parents involved in the garden project, the school is offering families their own small plots to cultivate. The rich diversity of Harris’s students will be reflected in the herbs and vegetables planted this spring for use in favorite cultural dishes. Plans are also in the works to donate part of the communal harvest to a local food pantry. “The pantry is so excited to get fresh produce. So much of what is donated is processed,” said Zuraw-Burns. Garden organizers hope that by giving back to the community, children at Harris Elementary—and their families—will become more aware of the needs of others in their neighborhood and around the world.